Introducing Strand by Strand Blitz™, Advanced Hair Studios latest ‘combination’ hair loss treatment program delivering the proven benefits of Advanced Laser Therapy®, combined with the guarantee of a full head of hair with our Strand by Strand® procedure, originally invented and developed by Advanced Hair Studio. 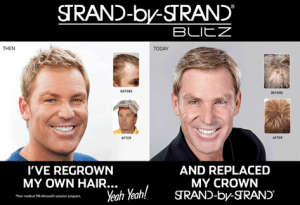 Advanced Hair Studio’s customized Strand by Strand Blitz™ Hair Replacement program allows you to continue to re-grow your own hair whilst addressing the need for a customized Strand by Strand® hair replacement program that specifically targets more aggressive hair loss in the crown or top of the head. Laser Hair Regrowth is approved by the FDA and TGA as a device which promotes hair restoration and regrowth. Advanced Laser Therapy’s Laser Hair Regrowth program scientifically assists our customers address their hair restoration and regrowth needs. Advanced Hair Studio’sStrand by Strand hair replacement procedure, originally invented and patented by AHS, looks totally natural from any angle and in any style. You can even enjoy short cropped hair styles whilst maintaining an undetectable hair line. Enjoy the benefits of two of Advanced Hair Studios leading hair replacement procedures, contact us for your free no obligation consultation today!